In summer 2011, when famine and violence were engulfing her country, Fadumo “Mama” Sharif Mohamed left Somalia with her husband and ten children. 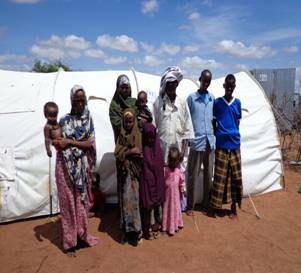 On their eight-day trek to the Dadaab refugee camp in Kenya, militia attacked them and they lost the family’s food. Her children, like thousands of others, suffered from malnutrition. But she and her family made it to the refugee camp and were put in a section called Kambioos, where Catholic Relief Services (a Caritas member based in the USA) is working to build and improve water systems. Fadumo became a leader as she settled into camp life. She was the founding member of the MIDNIMO women’s group, which began with 25 people and today has 183 members. The group does basket weaving, woodcarving, and henna decorating, and also bakes traditional bread. Due to strong management, the women’s group is able to successfully earn money by selling their wares in one of the marketplaces in the refugee camp. The profit they earn from their sales is put back into the business and it is then subdivided amongst group members. Catholic Relief Services came into contact with the MIDNIMO women through their hygiene promotion activities in Kambioos. As refugee incentive workers, these women earn a stipend for running hygiene promotion sessions within the camps. They teach their fellow refugees how to avoid waterborne diseases and stay healthy. The women use the stipend they receive to buy additional weaving materials, baking ingredients, wood, and henna ink. “Mama Sharif,” as she is known, is excited about the partnership and looks forward to improving hygiene behavior in her area. She also says that the income received from CRS will boost the group’s earnings and therefore raise the living standard of the women’s families. She says that the refugee community has benefited from the latrines CRS has constructed; before, refugees had to go to the bathroom in the bush. Having come from a nomadic community, hygiene and sanitation awareness was very low, but she is grateful to the organization for its effort in message dissemination and cleaning campaigns. Her face brightens every time she passes through the blocks on her way to the group’s weaving kiosk and sees people cleaning their compounds. There is a great change between the time she arrived and now. After their first 10 months in the camp, six out of ten of her children, 3 boys and 3 girls, are attending school in the camp and the family has access to food, sanitation and water facilities. But Mama Sharif is not ready to go back to Somalia because of the ongoing fighting and insecurity. For the time being, she and her family will remain in the camp where there is peace and nothing to fear.